Low-budget, high-concept fight film which deals in virtual reality and kickboxing robots. In a dystopian future, rich humans have ruined Earth and live in luxury on the moon. A prominent VR expert is needed back on terra firma and takes the next spaceship to New Los Angeles, which is full of crime, degradation and corruption (nothing new there then). He is killed by a gang involved in organ trafficking for a company known as New Body, which seems to be harvesting body parts for cosmetic reasons and creating elite human beings. 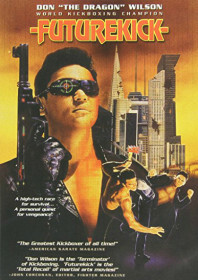 His wife shuttles over to investigate, enlisting the help of Walker (Don “The Dragon” Wilson), the last of the Cyberons – a defunct, high-kicking robot which has been hunted to extinction by the corporate police. This being a Roger Corman film, a lot of the dialogue scenes take place in a strip-club. It’s a little too hammy and studio-based to ever be taken seriously as a sci-fi film, but it is still a strange and valiant effort. And kickboxing champ Don Wilson doesn’t have to strain his dramatic chops too much in an early acting role.